Internet connection with DSL 1000 speed or higher for the registration and the update of the Nero 8 help files and other functions. It is also required for the activation of the complete functional range (DVD, MPEG-2, MPEG-4, and AVC), which will be required 30 days after installation. This activation is free of charge. The costs for the Internet connection are carried by the user. 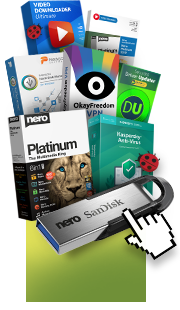 To install Nero 8 you must have administrative rights for all operating systems higher than Windows® 2000. TV tuner or video capture card for analog or digital (DVB-T, DVB-S, DVB-C, and ATSC) recording, compatible with the BDA (Broadcast Driver Architecture) driver standard. 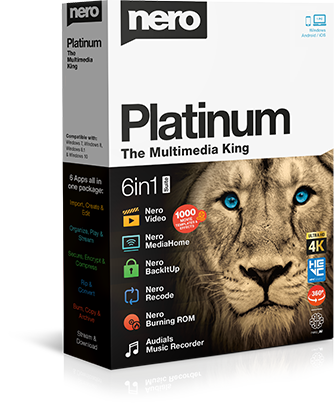 Nero Home does not support video recording via FireWire® (OHCI 1394). DVD-Video Multichannel Plug-in, or DVD-Video Plug-in, and/or Multichannel Plug-in* for DVD video recording and the "DVD-9-to-5" function. Graphics card with at least 256 MB video RAM based on: nVidia GeForce 6600GT, 7600GT, 7800GTX512, 7900GS, 7900GT, 7900GX, 7900GTX, 7950GT, 7950GTX, 8500, 8600, 8800, 8400M, 8600M or newer. ATI series X1600, X1650, X1800, X1900, X1950, Radeon HD or newer in one of the following board and screen combinations: PCI-Express/Onboard video board with built-in display (e.g. notebook or integrated PC). PCI-Express video board with support for DVI/HDMI and HDCP, screen/television with HDMI input or HDCP supported DVI input. PCI-Express video board with VGA output and VGA monitor. PCI-Express video board with component video output and video output, CGMS-A and Macrovision support, television or projector. On analog monitors some discs display only at low resolution or not at all. Internet connection for updating AACS keys. These are needed in order to play AACS protected Blu-ray Disc and HD DVD videos. See the respective device manual to determine whether a screen or TV device supports HDCP. * Already available in the full version.